A new season of Iyanla: Fix My Life returns with a powerful, 90-minute episode. 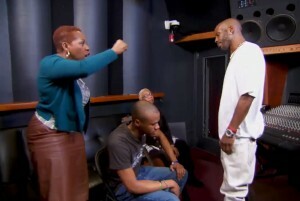 Iyanla travels to multiplatinum rapper and actor DMX's hometown of Yonkers, New York. Things go awry as DMX's emotions run high and his temper takes over. To say that DMX was one of my favorite rappers is putting it mildly. I can vividly remember going to see the ‘Hard Knock Life’ tour simply to see DMX. He was one of the most exciting emcees I have every gotten a chance to witness perform. I even got a chance to meet him after the show, and let’s just say that he was everything you thought of him and more. He was definitely a person of the people. He was super friendly and very humble. He wasn’t the arrogant, narcissist, as rapper, that I thought him to be. So to see what has become of his life is very sad for me. Here is a man that has all the talent in the world, but yet cannot find a way to get out of his way. In listening to X’s music, it’s obvious that he has a lot of demons he’s battling. As a fan I use to believe he would be able to conquer those demons, but as evidenced by this video and his recent actions, it would appear that the demons are winning. I’m glad Iyanla took it him and confronted him in that video. If you look closely you can see him transforming into a little boy when she pushed back on him. There was a look of surprise in his eyes as though he wasn’t use to anyone talking to him in such a manner.